Director Steven Spielberg and producer Peter Jackson’s Tintin comic book adaptation - which is internationally-titled The Adventures of Tintin: The Secret of the Unicorn - will begin opening in theaters throughout Europe nearly two months before it reaches the U.S. 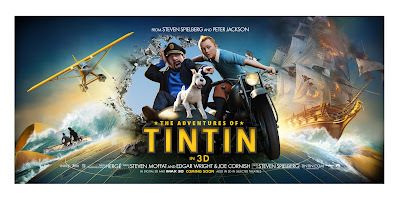 Hence why most of the latest theatrical and television previews released for Adventures of Tintin have been in non-English languages - and the latest (Spanish) Tintin trailer is no exception. However, just because you might not understand what the characters are saying, that doesn’t mean you won’t still be able to appreciate the shiny visuals and thrilling action sequences on display. Adventures of Tintin is based on three Tintin graphic novels - “The Secret of the Unicorn”, “Red Rackham’s Treasure”, and “The Crab with the Golden Claws”, to be exact - by the character’s creator: acclaimed Belgian writer/illustrator Georges Remi (who wrote under the pen name Hergé). Spielberg’s film therefore revolves around the efforts of intrepid journalist Tintin (play by Jamie Bell) and his ever-loyal pup Snowy to track down a mysterious ship known as the Unicorn - and uncover the legendary treasure of Sir Francis Haddoque. The pair encounter many a colorful character on their adventure, including Haddoque’s loveably roughneck descendant, Captain Haddock (Andy Serkis); the well-meaning, but comically-incompetent Inspectors Thompson and Thomson (Simon Pegg and Nick Frost); and Red Rackham (Daniel Craig), a villain who’s after the treasure for his own diabolical reasons. One thing this new Adventures of Tintin theatrical preview makes clear is that the performance-capture motion picture was clearly designed to be viewed in three dimensions. There’s virtually no stereotypical 3D gimmickry on display here; instead, the action set pieces (ex: Tintin using part of his motorcycle to slide along a telephone wire) appear to have been shot with the intention of creating an immersive cinematic experience. Most everyone knows that Spielberg has long been enamored with period action-adventure stories, and the Tintin adaptation looks to be a nice addition to his directorial resume - not to mention, a good return-to-form following the decidedly mixed reception given to his last film, Indiana Jones and the Kingdom of the Crystal Skull. We’ve gone on before about issues related to the expressive and facial design of the Tintin characters - which, all complaints aside, do actually look like an improvement on the humans in previous mo-cap films (see: The Polar Express, A Christmas Carol, etc.). Adventures of Tintin probably won’t win over most detractors of the performance-capture technology - as far as it being used to animate people, that is - but it should be a step in the right direction. The Adventures of Tintin was also scripted by a crew of fan-favorite writers, including Edgar Wright (Scott Pilgrim vs. The World), Joe Cornish (Attack the Block), and current Doctor Who showrunner, Steven Moffat. Given that all three of these gentlemen are known for crafting quality films/TV shows that boast a clever mix of genre elements - including fantasy, sci-fi, mystery, and adventure - their involvement is yet another sign that Spielberg’s Tintin movie will be something special. Look for The Adventures of Tintin to arrive in 2D and 3D theaters around the U.S. on December 23rd, 2011.